Review: I would like a Pixie haircut please! is something that Bessica Lefter never thought would change her entire life for the worst. 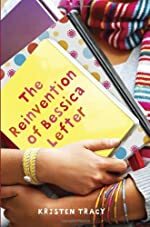 In The Reinvention of Bessia Lefterit tells about a girl named Bessica Lefter and how her life is flipped upside down from just one trip to the mall. The author (Kristen Tracy) really showed how this girl faced middle school by herself, with no best friend to keep by her side. When Bessica calls her best friend, Sylvie Potaski to go shopping for new school clothes, somehow her whole life gets as bad as it could ever get. They want to go from elementary school to middle school as completely new people. To do so they decide to get all new clothes, get all new haircuts, and go to a different school than their elementary classmates. When Sylvie walks into her house with her extremely short haircut, her mother goes crazy. She even goes to Bessica's house to forbid the two girls from ever seeing each other again. Therefore, Sylvie has to go to a different school than Bessica. This makes Bessica go crazy as well. But not only does Bessica have to face middle school by herself, but her grandmother (the only one who seemingly understands her) is going on a trip with her crazy boyfriend she met online, for six whole months! She has already planned to try out for many things and join many clubs, so even though she's alone she still does everything as planned, in hopes of making new friends. But in the end when she almost tries out for cheerleading, something else much unexpected happens, and she tries out for mascot! In the end she ends up fighting for the spot against a popular cheerleader, and a puker! Will she work as hard as she can for the coveted spot of mascot? At this point, Bessica doesn't even know if she will! There were things that made me like the story at some points, but at other times, I didn't seem to enjoy it as much. For example, at times the author would go into extreme detail, and then go completely off the topic as described. But then I usually liked how the author made it seem like Bessica was actually telling the story, she did this by saying and doing things that adults usually wouldn't do. For example, I don't imagine adults calling their friends stupid very often, or going to the mall to buy new school clothes. I feel this way because she said things that I don't imagine adults saying to their friends. I also didn't like how she overused some terms that sixth graders would use. One term that the author overused was "not so hot". Sometimes it wouldn't even make sense with what the author was saying or explaining. This story did not win any awards but I indeed think that in some point in time, it will since it is a recently published book. Review written by Bianca (6th grade student). We would like to thank Random House for providing a copy of The Reinvention of Bessica Lefter for this review. Have you read The Reinvention of Bessica Lefter? How would you rate it?